My 3rd great grandfather, Patrick Miles, was a tall man. Apparently he was one of the tallest in the county of Washington (or Daviess), Indiana at the time of his death in 1903. 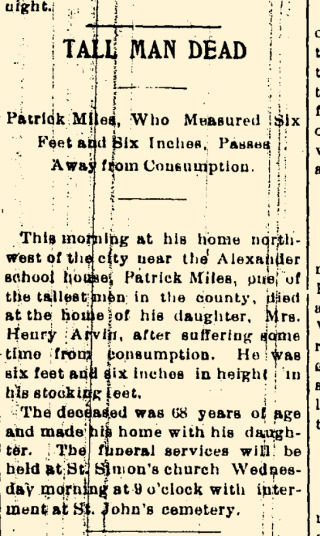 He stood 6 feet and six inches "in his stocking feet" as his obituary suggests (from the Washington Herald in Washington, IN on March 24, 1903). When Patrick Miles was born in Indiana in May of 1834 his father, Hileria Miles (1797-1855), was 37 and his mother, Mary Frances Clements Miles (born around 1800), was 34. Patrick was the grandson of my 5th great grandfather, Wilfred Miles (1755-1825). Wilfred was one of the several well documented first settlers near Casey Creek in Kentucky. Here is a post I wrote about him last year: Genealogy, DNA, and the Discovery of Wilfred Miles. Patrick was not mentioned in that book, but his father and grandfather were. Patrick had one son and three daughters with Mary Matilda Strange Miles (born about 1839). He then married Nancy Anna Burch, presumably after Mary died (details about Nancy are sparse). Patrick and Nancy had several children, one of which was my 2nd great grandmother Clara Rachel Miles/Myers Sears (1875-1934). Who was Nancy Anna Burch's first husband and what happened to him? There were several "Walker" children living with Patrick and Nancy in the 1880 census listed as Patrick's step-children. Though born a Miles, Clara Rachel had a child (my great grandfather, Arthur Myers/Sears) with an Oliver Myers. Oliver remains a shadowy figure in my family tree. It is clear, however, that Arthur's surname was changed to Sears when his mother married her 2nd husband, John Sears. In 1880 Patrick was living with his second wife, Nancy, and many children and stepchildren. In 1900 he was living with his daughter (from his first marriage) and his son-in-law. The missing 1890 census makes it difficult to know what happened in the years in between. I don't have death dates for either of Patrick's wives, so it is not clear why he was living with his daughter and son-in-law. Presumably, his wives were either deceased or out of the picture for some other reason. Little else is known about Patrick. As I begin to fill out my family tree with distant cousins perhaps some new details will emerge. Where was Patrick living in 1890? Do any photographs of Patrick exist? Was Patrick's first wife related at all to his son-in-law and, if so, how? How were blended families and step-parenting in the the 1800s different from 2018? Patrick was a "tall" man. Was he imposing? Frail? By all accounts my great grandfather was estranged his father (my 2nd great grandfather). Did he have a relationship with his mother who lived until he was 34? How does family conflict (e.g., estrangement) in one generation impact the generations that follow? This is the 6th of 52 weekly posts planned for 2018. It was inspired by the #52Ancestors writing challenge issued by professional genealogist, Amy Crow Johnson. The challenge: once a week, for all 52 weeks of the year, write about a relative in your family tree. This is Sister Jamesetta Rhoads. Born Lucille Rhoads (1906-2004), she is my first cousin twice removed. Sr. Jamesetta is one of several in my family tree who devoted their lives to a religious order.